<p />Finally got some pix off my camera from this weekend's cowboys and injuns game Pit Beef. First time I have cooked anything like this, and being stubborn I had to try something new. Instead of searing at the beginning, I smoked this 8 pound top round roast for 5 hours at 210 degrees until it was 132 internal. Then seared the pants off of it on a blazing medium egg. [p]The color was amazingly even all the way through, and the roast barely gave up any juice during the slow cook. I was expecting half a pie pan of drippings, but only got a few drops. Nice subtle smoke flavor and a tantalizing peppery crust. Piled high on a toasted kaiser roll with some hoss radish, and we wuz in high heaven.[p]cheers! 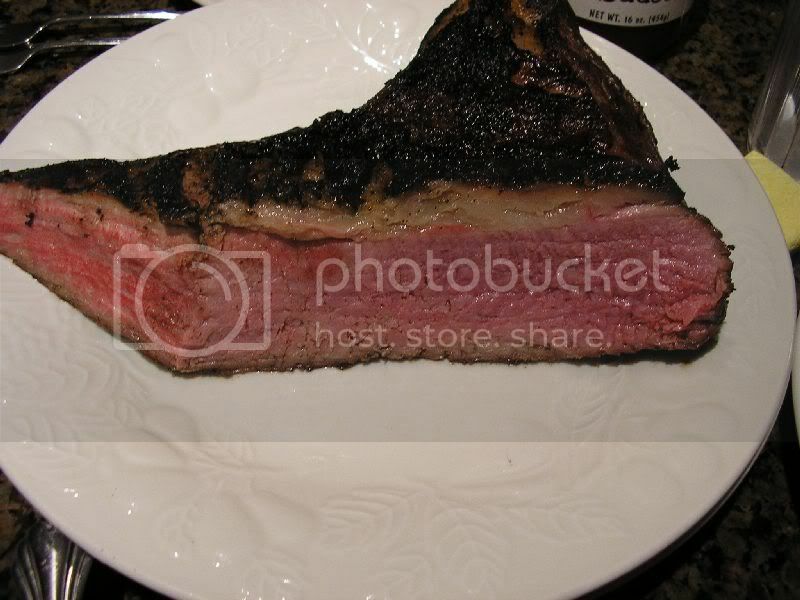 thats absolutly the best roast beef pic ive seen yet. always have done them at higher temp, but definately going to try that, 210, indirect? Thank you. Like I said, I am new with beef roasts, so not much to compare to. But we had very little in the way of leftovers, so I figger it was alright! Yeah, indirect. I was gonna go higher (like 250), but it was moving along pretty well at 210 so I just left it there. [p]Forgot to mention I used a coule nice cherry chunks for smoke. Twas an 8 pound top round roast from Costco. Slathered in olive oil and an overnight sit with a blanket of Cow Lick. sorry i missed you on sunday. ..that looks outstanding!! !. ..[p]which rub did you use?? ... i love 'red eye' on pit beef. ..
That's beautiful looking meat. I've been working on the same method, my new change is a lighter sear at the end. I just did a tri-tip and had pink straight across the cut. I'm VERY satisfied with this method so far. [p]Your cook looks blue ribbon! Are there BBQ competition categories for shaved pit beef? Nature Boy, now you see why I like roasts slow cooked first then seared last. Also makes a nice presentation with the even full color of meat. Tri-tips done this way are outstanding. You're way ahead of me, Chef! Was it 210 degrees at the grate or the dome? I've got to try that. Looks yummy! Both my wife's family and my family want me to cook Christmas dinner on the eggs. had planned on turkey and pork loin, but now I'm going to have to add that beef! 210 grate. The dome was running about 225 the way I had it set up. [p]Yeah, you gotta do the beef. I was at the grocery store the other day lookin at those beef roasts, and WessB's pit beef popped into my mind. I couldn't shake the craving and had to go back out and git me a roast. Will do this one again as it is a pretty low maintenance cook. [p]'Appy 'Olidays! I cooked a 2 3/4 LB tri-tip by searing 5 minutes each side at approx. 600 degrees, then took it off and brought the BGE temp down to 300 degrees. Put it back on for 10 minutes per side, and came out great, sort of medium to medium rare. I used a rub I made on each side, marinated overnight. When will I know when I have learned?? [p]Funny, I think of cooking sorta like law or medicine where you are always "practicing". The sear had very little effect on the internal temp of that beast. The interesting thing is that since very little heat was being applied for the roasting/smoking, the internal temp must have risen very little during the rest. (I did not measure it after removing). The sear put a pretty heavy burst of heat on the meat for a few minutes, but doesn't really carry over to the middle. It was not rare, but I'd prolly call it a solid medium rare all the way through. Still learning bigtime though, but it was pink not bloody. Bet Sally would be into it. You gonna go down the "Reverse Sear" route?? I didn't coin a technique, but I might have coined a phrase!!! cheers to yall, and Merry Christmas.